In the NFL, with only 16 games in the regular season, every game is important. However, as we roll in to the final week of the season, there are three absolute must-win games. Rams-Seahawks, Titans-Colts, and Bears-Packers. For all intents and purposes these teams each have a playoff game in week 17. 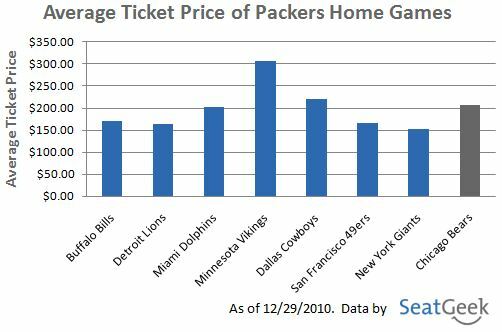 Since these game can almost be classified as a playoff game we thought it would be interesting to take a look a the ticket prices on the secondary market for each of these games to see if fans are willing to pay more for the week 17 must-win games than an average home game during the regular season. St. Louis Rams at Seattle Seahawks at Qwest Field on Sunday at 8:20PM – This game is basically the first round of the playoffs for these two teams. The winner of this game will win the NFC West and advance to the playoffs and the loser will be watching the rest of the season from home. The average ticket price to the Seahawks-Rams game this weekend is $93.30, just 79.5% of the cost for an average Seahawks home game this season. 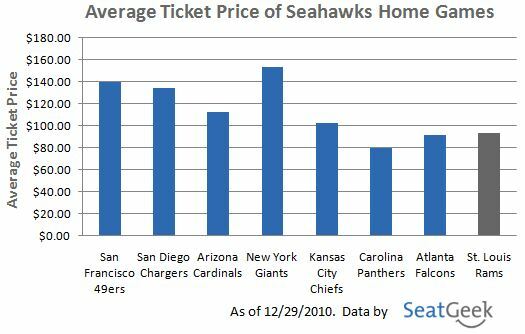 With an average ticket price of $93.30 this game ranks as the 3rd least expensive Seahawks home game this season and the 12th most expensive game in the NFL this weekend. It is a little surprising that ticket prices for the Rams-Seahawks game are not higher but then again this is the NFC West and you really can’t be surprised about anything in the NFC West this season. Tennessee Titans at Indianapolis Colts at Lucas Oil Stadium on Sunday at 4:15PM – This is a must win game for the Colts because if they lose and the Jaguars win against the Texans they will not advance to the post-season for the first time in 8 seasons. The 5-10 Texans do not have much to play for since they are no longer in playoff contention and it is likely that the Jags will beat them on Sunday so it is absolutely vital for the Colts to beat the Titans this weekend. 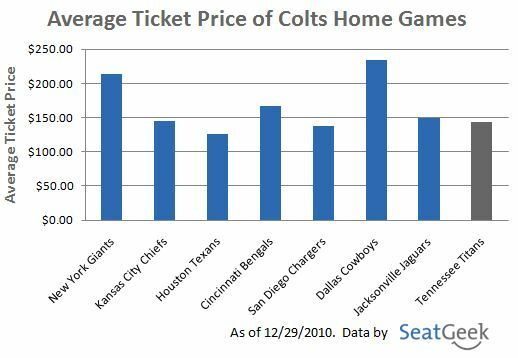 The average ticket price to the Titans-Colts game this weekend is $142.94, just 83% of the cost for an average Colts home game this season. With an average ticket price of $142.94 the Titans at Colts game ranks as the 3rd least expensive Colts home game this season and the 6th most expensive game in the NFL this weekend. We were a little surprised to find that ticket prices for this extremely important game are not higher compared to the rest of the Colts home games. Chicago Bears at Green Bay Packers at Lambeau Field on Sunday at 4:15PM – This is a must win game for the Packers because if they lose they need both the Giants to lose to the Redskins and the Buccaneers to lose to the Saints in order to clinch a wild card berth. The average ticket price to the Bears-Packers game this weekend is $207.42, which is just $2 more expensive than a ticket to the average Packers home game this season. With an average ticket price of $207.42 the Bear-Packers game ranks as the 3rd most expensive game at Lambeau Field this season and the most expensive game in the NFL this weekend. Are you surprised that the ticket prices for the Titans-Colts and the Rams-Seahawks games are relatively low considering the impact that each of these games has on the outcome of the entire season? Let us know in the comments or on Twitter @SeatGeek.